It took six months of paddling. But two women broke a record by canoeing across the United States this year. 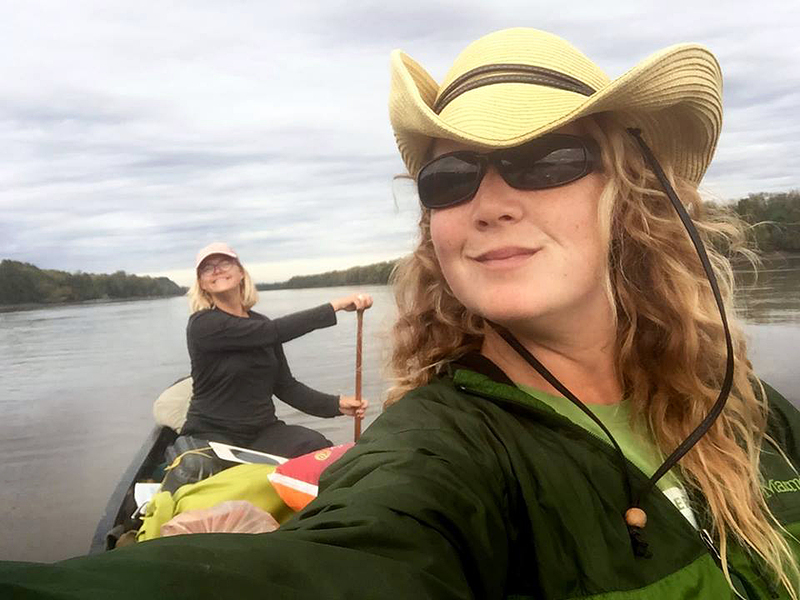 Heat, armies of bugs, and dangerous storms didn’t faze Lisa Pugh and Alyce Kuenzli as they became the first female team to canoe the Jefferson-Missouri-Mississippi river system. For six months during the summer of 2016, the pair paddled thousands of miles and conquered the fourth-longest river system in the world. “I just wanted to go canoeing,” Kuenzli said with a laugh when asked why she took on the challenge. But her and Pugh’s motivations ran deeper. They wanted to be the first women-led expedition to complete the trip. “And we wanted to document the confidence-building process, and share that process with other girls and women along the way,” Kuenzli added. The desire to empower women inspired them to create the Source of Confidence. This nonprofit supports females in navigating their own paths to confidence in the backcountry. With extensive backcountry resumes, Pugh and Kuenzli were no strangers to expedition life. A former Big Ten Conference rower, 29-year-old Pugh spent years guiding in Minnesota’s Boundary Waters Canoe Area (BWCA). Kuenzli, also 29, paddled extensively on her own and as an instructor at Minnesota’s Voyageur Outward Bound School. The duo met and bonded while guiding. Kuenzli started brainstorming the Jefferson-Missouri-Mississippi trip in 2015. She had completed an expedition down the Mississippi River and wanted an even greater challenge. She also wanted a partner. Pugh immediately accepted an invite. 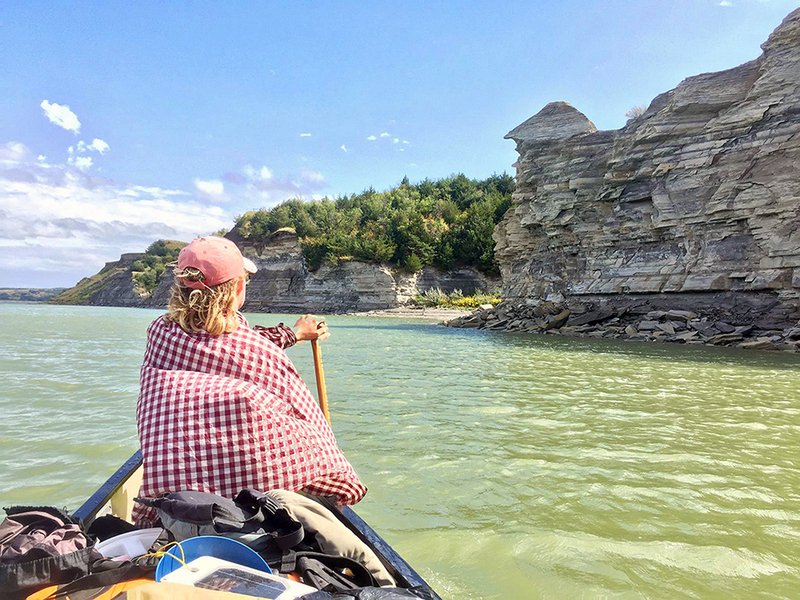 They reflected on their lack of guidance as youngsters in this realm and the fact they gleaned strength, self-reliance, and self-assurance by taking on increasingly greater paddling challenges. They wanted to show other women and girls how to navigate their own paths to confidence through positive risk-taking in the backcountry. Kuenzli and Pugh embarked on their expedition May 11, 2016, in southwestern Montana. A two-day trek through snow brought them to the source of the Missouri River and the headwaters of the Jefferson River—Brower’s Spring. From this starting point at 8,800 feet, it took the team nine days hiking over washed-out roads, and through hail and rain to make it to the Clark Canyon Reservoir. There, they started paddling the Jefferson. Over the next 100 days, as they followed the Upper Missouri from Three Forks, Mont., to Yankton, S.D., they faced 100-degree heat, bugs invading their tents, sleepless nights, and storms that drove them off the water and hammered their camps. They averaged roughly 10 miles per day until the current of the Lower Missouri propelled them at quadruple that rate toward the Gulf of Mexico. Once on the fast water, Pugh explained that she and Kuenzli developed a strong yet malleable rhythm some teams never achieve. On November 27, 2016, the team paddled the final leg of the Mississippi River, into the Gulf of Mexico, and they became the first all-female canoe expedition in history to complete the route. 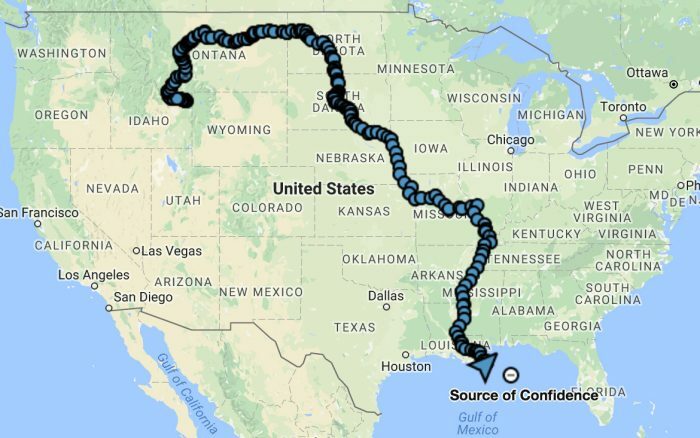 Their path wound through and along the borders of 14 states and across 3,902 miles of waterways before it spilled into the Gulf of Mexico. The year-and-a-half adventure included 12 months of meticulous planning and fundraising, and then six months of canoeing. They reached the end of an epic adventure, but this is just the beginning of the Source of Confidence Organization. The two women now seek to serve as role models through outdoor adventure. They will create curricula for building confidence, produce a documentary about their expedition, and teach workshops on empowering women. –Read more about the expedition at SourceofConfidence.com.